Town house of character, situated close to the centre of town in the old district of La Roquette and near the Rhone River. The property is approximately 130 square metres, and is fully furnished to a high standard with electric central heating. Available all year round with special price for long winter lets. The town of Arles is situated in the Provence region of France, offering outstanding scenery, warm and sunny climate from April to late October. Arles is a short driving distance from the mediterranean sea and the Camargue Wildlife Sanctuary. Dual nationality, living in London. I own this property and rent out for holidays when I am not using. I am very particular about the appearance, comfort and character of the dwelling which I cherish as home from home. I do hope people staying in it, will enjoy and appreciate the effort done to keep it to a high standard. France, with its diversities in climate, customs, food, sceneries and culture, appeals to holiday makers from around the world. The Provence area of France has a Mediterranean climate giving its habitants an easy going outlook on life very different from the northern par of Europe. Sceneries, climate and colour of the sky are unique to this part of the world which always enchant me when I visit. The weather is Mediterranean with strong sun shines in the summer making sceneries lit up to forget the grey sky of yesterday. Change of sceneries and way of living with guaranteed warm and sunny days from April to June and very hot weather ,July to September October to December are cool but pleasant. In Provence you will get a complete rest and change of way of life. Upstairs 2nd floor lounge with television, including access to the roof terrace. Kitchen with electric cooker, oven, fridge , microwave, washing machine and dishwasher. Satellite TV with some English programs in the lounge. The televisions in the other rooms show French programmes only. Spacious roof terrace - large enough to accommodate 4 people for dinning also suitable for sun bathing and evening relaxing. It can be very hot in the summer months. Notes on accommodation: The house is situated on a pedestrian street (no cars) the front door opens into the dining/kitchen area with a staircase leading to the upper floors. Outside: Roof terrace with flowers and plants, set of table & chairs, and sun lounge. Cleaning / Towels / Linen: Towels and linen are provided. House is cleaned on arrival and departure. Other: Dining room/open plan kitchen, large lounge and roof terrace. The house is on four floors but we quickly got used to the stairs. The top floor outside space is delightful and very quiet. The house is well furnished and equipped and we very much appreciated the mosquito blinds on every window. It’s lovely to stay in a residential area with easy access to all the amenities and bus stops. This was a home from home. The owner was extremely responsive. Lots to do around about with restaurants, bars music in the streets, culture,history. House has lots of stairs and in the very hot weather would benefit from proper air con in the bedroom. Roof terrace is a bonus. Love the winding streets in the neighbourhood. So quiet at night. Everything about the property was perfect. Location is excellent - lovely restaurants a few minutes walk from the house. You really do get a feel for living in the town. Highly recommended. Many thanks for your comments . I am glad that you enjoyed the house and Arles. 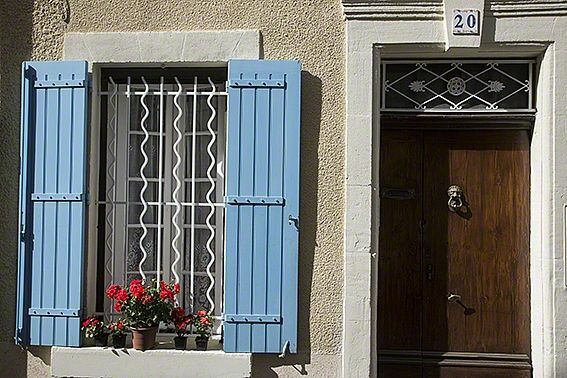 This very old townhouse sits on a quaint street just next to the Rhone River. It is just a few minutes walk from restaurants, bakeries, grocery stores, and historic sites. We were two couples in our 60s. We sat out on the rooftop terrace with wine and cheese to relax at the end of each day. The owner was very quick to respond to any questions. As mentioned in another review, there are a number of winding stairs to reach the bedrooms and terrace, but they were not a problem for us. We would return to this house again. Many thanks for your kind words about the house in La Roquette and I do hope that you will use it again and tell your friends who want to visit the provence region of France. Well located, interesting and well equipped. Arles is a must for those interested in history, art, eating and drinking and the property fits the bill perfectly. Küche - Parterre, 2 Schlafzimmer - 1. Etage, Wohnzimmer - 2. Etage, Dachterrasse - 3. Etage; alles verbunden durch Wendeltreppen. Dachterrasse - super (weiter Blick über die Dächer). Internet - kein Problem. Möbel/Einrichtung - engl. Geschmack. Parkplatz - gebührenpflichtig 150 Meter entfernt (wir haben immer einen Platz gefunden). Ein- und Ausladen des Gepäcks geht über den Quai de la Roquette (da kann man mal am Straßenanfang der Rue Croix Rouge halten; dann sind's noch 50 m bis zum Haus). Gastronomie in der Nähe gibt's reichlich an der Place Paul Doumer (mehrere Restaurants; 200 m vom Haus Richtung Innenstadt). 2 City Supermärkte 250 m weg. Innenstadt 15 Minuten Fußweg. Resümée: ein guter Standpunkt, um Arles Stadt und die Umgebung zu erkunden. Wir haben dort 2 Wochen gerne verbracht. Arles is situated in the Provence region of France and the wild life reserve of the Camargue. It is renowned for its Roman antiquities including an amphitheatre, theatre and an outstanding museum full of roman vestige. Sandy beaches and good swimming 15 miles away in the Carmargue. Nimes airport 10 miles, Avignon airport 15 miles, Marseilles airport 50 miles. Ryanair flies daily from London Luton to Nimes and Easy jet from Gatwick under 2 hours and at very competitive prices. TGV fast train to Arles in just 3 hours from Paris, and 4 hours from Lille where you can catch the Eurostar to London. Eurostar also has a direct service from London to Avignon TGV. Cars can also travel by train from Calais to Avignon. Travelling by car from the UK will take approx.16 hours from Calais non-stop or 2 days at leisure. Car hire is recommended to explore the region. Nearby towns include Aix en Provence 76km, Avignon 36km, Nimes 22km, Marseilles 89km. Aigues Mort and Montpellier are 1 hour by car, and Saintes Marie de la Mer and Port Saint Louis offer sandy beaches and good swimming 30 minutes away in the Carmargue. These are only a few of the interesting places you will be able to visit when in Arles. The tourist office, right in the middle of town will advise you further. Bonnes Vacances! The Provence region of France and the Carmargue is warm and sunny from April to October. This region of France is famous for its lifestyle, cuisine and art. Many painters, including Van Gogh who lived and worked in Arles, greatly contributed to the fame of the region. In Roman times, Arles was a very important town within the Roman Empire. Many vestiges of its glorious past are still here today, including the magnificent amphitheatre where various activities take place such as bullfighting.